Boren Investment Company Warehouse in South Lake Union – Seattle Landmark? 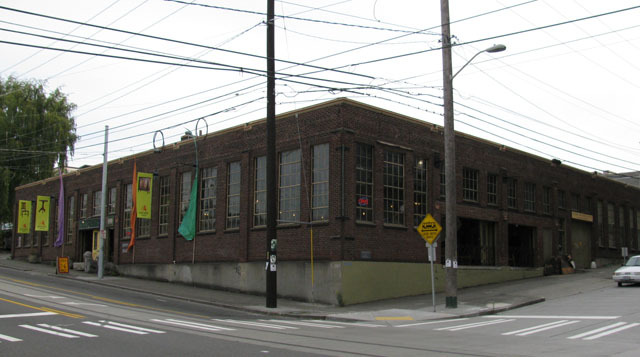 The Seattle Landmarks Preservation Board (LPB) will decide whether to designate the Boren Investment Company Warehouse (334 Boren Ave N, Seattle) as a Seattle Landmark on Wednesday, October 19, 2011. The LPB nominated the property in a 5-3 vote at its September 7 meeting. The October 19 meeting is open to the public and is held in the Municipal Tower, 700 5th Ave, 40th Floor, Room 4060. Members of the public may provide public comment at the meeting. We encourage you to attend if you care about the future of South Lake Union, its heritage and neighborhood character. You can download the nomination here under 334 Boren Ave N. The agenda is available here. The property is threatened by planned new development on the entire city block which also includes the designated landmark Troy Laundry Building (311-329 Fairview Ave N). The Seattle Times sold the entire block to Touchstone Corporation which plans to redevelop the site. To date, Touchstone has twice briefed the Architectural Review Committee of the LPB, presenting preferred alternatives that preservation advocates view can do way more to preserve both the landmark Troy Laundry building and the historically significant (and we hope soon-to-be-designated) Boren Investment Company Warehouse. In its review of the landmark nomination, the LPB cannot consider future plans for the Boren Investment Company Warehouse or site. The LPB must base its decision on whether the building meets the designation standards. A property under consideration just needs to meet one of the standards. Historic Seattle, the Washington Trust for Historic Preservation and neighborhood advocates have been working together to support the nomination and designation of the property. We are also concerned about the future of the building, the Troy Laundry building and the redevelopment plans for the block. We always look for a win-win solution and believe that both buildings can be incorporated into the new development. This has proven to be possible in South Lake Union, the best example of which is the 320 Terry Avenue building, a former warehouse that was later used as offices and has been renovated and adaptively reused for restaurants. In this Vulcan project, new construction was designed and built around a landmark building and more than the facades were preserved–the entire building was preserved. The architectural heritage of the Cascade neighborhood and South Lake Union area is an eclectic one. The presence of warehouses that are indicative of the light industrial history of this area is particularly important and evokes this sense of place. The Boren Investment Company Warehouse has been and remains significant to the community. Standard C: Its significance is derived from its association with the development of the Cascade/South Lake Union neighborhood as a light industrial part of the city mixed with commercial and residential uses. Sanborn Fire Insurance Co. Map research (c. 1951) shows that there were approximately 50 extant buildings or building complexes in the South Lake Union area that had been designed for or were used for warehouse and storage purposes. Today, there are 16 extant buildings or small building complexes in the South Lake Union area that were designed for or historically used for warehouse and storage purposes. The neighborhood has evolved over the decades, particularly within the last five years. The light industrial and warehouse heritage is a significant part of the development story and the Boren Investment Company Warehouse represents this story well. Standard D: The property is significant as an excellent example of warehouse architecture and is one of the most intact examples of its type in the neighborhood. Character-defining features of the building include the exterior masonry walls (particularly the primary north and west red brick facades); window/storefront bays divided by brick pilasters with buttress capitals; original multi-lite industrial steel window sash and original loading area doors; parapet coping; skylights; heavy timber internal framing; and interior expansive volume of space. These interior features appear to be particularly distinctive and intact and are also worthy of protection. About 12 of the 16 remaining (out of 50 that were extant in c. 1951) industrial or warehouse buildings have been significantly altered and do not exhibit distinctive warehouse design features and would not meet landmark designation standards. One very small storage building remains relatively unaltered; however, it is undistinguished and would not meet landmark designation standards. Two former warehouse buildings have been previously designated as City Landmarks: Ford Assembly Plant (Fuller Brush Co. Warehouse in c.1951) and 320 Terry Avenue (plywood warehouse in c.1951). In addition to the two Landmark properties, the Boren Investment Co. Warehouse is the most well-preserved and by far the most architecturally distinctive extant warehouse building left in the South Lake Union area. Standard E: The property is an outstanding work of architecture and engineering firm Stuart & Wheatley. The firm’s known body of work consists of mostly apartment and hotel buildings in Seattle. The nomination form lists two other warehouse buildings designed by the firm—Knickerbocker Co. (altered) and Alex Christie & Co. (very altered). To compare apples to apples (warehouses to warehouses as opposed to warehouses to apartments), the Boren Investment Company Warehouse is the best example of the property type designed by the firm compared with the other two known extant warehouses which have been altered (the Alex Christie & Co. Building in particular is practically unrecognizable as an older building due to extensive alterations). Standard F: Because of the property’s prominence of spatial location, age, and scale, it is an easily identifiable visual feature of South Lake Union. Due to the changes in neighborhood context, the Boren Investment Company Warehouse stands out and provides significant neighborhood character. Stay tuned and we’ll report back later this week on whether the property gets designated. We hope so!